A subscriber form is a simple form used for website visitors to easily signup to receive Tellem campaigns from you. Once the form has been added to your website all a visitor has to do is fill out the form and confirm via an automated opt-in email and the system will automatically add the signup to your subscriber list for you. 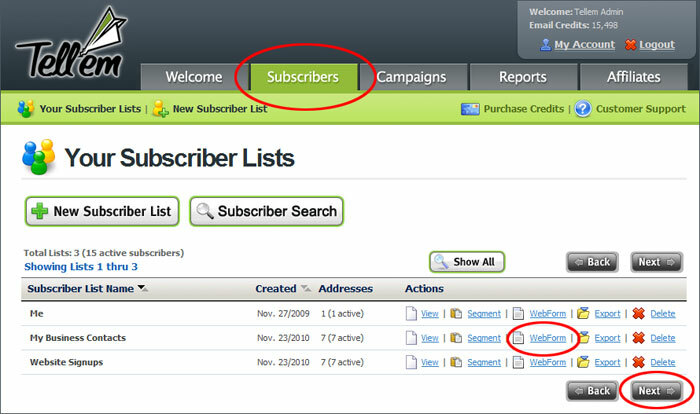 To create a new subscriber form that can be used on a website follow these steps. 1. Click the Subscriber tab. 2. Click Webform to the right of the list you want to create a form for. 3. Fill out the form to specify which fields you want to display and how you want them to display. Select Hide Field Labels if you do not want to display the name of the fields. Select if you want the Button location to the right or under the field names. Select the Input field width to determine how long the display field will be. Select any additional fields you want to include in the signup form. Note: If you are planning to personalize your campaigns you will want to capture their first and/or last name. Select if the field is a required field (the signup will have to enter infoamtion into a required field in order to submit. You can select multiple fields to include in the form and not set it to required and hope the signee will fill all the fields in but you will also not scare them off by requiring to much information they may not want to provide. Note: It is very common to require First and Last Names and the Email Address. 6. Give a name to your subscriber form such as "Newsletter for My Business" this will also appear in the opt-in the signee is sent. 7. You can customize the look of the form to match your website by specifying font colour and size as well as filed background and form background. Select Yes in the Send Message box if you want to send a Thank you message to the signee for signing up. Specify the From Name, From Address. Tyoe in a Subject line such as "Welcome to My Business Newsletter." Type in a short message such as "Thank you for subscribing." All of these fields have default values in them already. You can keep these values or change them to what you want to say. 9. Select Yes in the Send Notification box if you want to be notified of a new signup. Enter the email address you want the notification sent to. 10. Click the Generate button to generate the code that you can insert into your website. 11. Copy and paste the code snippet(use the handy Copy to Clipboard button) into your website. 12. Click OK once you have successfully copied the code to your website.